This is a social evening featuring gourmet wines and food with proceeds going to university’s hospitality business management and wine business management programs. The evening will feature six Hamilton wines paired with dishes developed by WSU Pullman lead chef Jamie Callison and WSU students that integrate local and seasonal tastes and flavors. Elegant food and wine served at 2017 Crimson Food and Wine Classic. 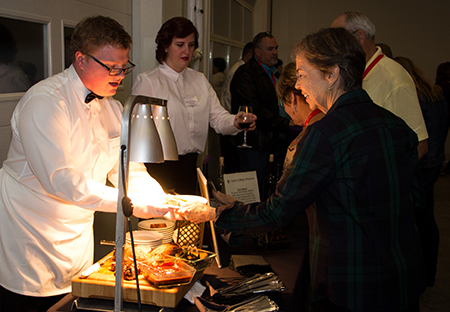 During the event, students will also present food pairings, manage a silent auction and interact with guests. An example pairing is house-smoked salmon bacon served with roasted Northwest beets, WSU Cougar Gold Cheese, blushing beet stems and paired with 2013 Hamilton Cellars, Weinbau Vineyard Cabernet Franc. Hamilton Cellars is located at 55410 N Sunset Rd. in Benton City. The cost is $75 per person on a first-come, first-served basis. Tickets may be purchased at https://formtool.wsu.edu/ccb/Signup/index.castle?formid=33. For more information, contact Deanne Pilkenton at 509-372-7264 or Deanne.pilkenton@wsu.edu.